Accomplished professional with over 20 years of comprehensive experience after post graduation in ophthalmology. Strongly believes in ethical and humane approach to health care. Experience gained from prestigious national and international eye institutes. Invited in various Ophthalmic Conferences over past 20 years as Chairman /Judge/Speaker / Moderator/ Convener. Talks on various Clinical Practices especially Suture Less Cataract Surgery/ Glaucoma, including performing live Surgeries. Organize and attend various CME, Conferences and wetlabs from time to time at the past and current places of work. Editorial Board’ D.O.S. Times” for 3 years-’99 to’02. Organized & attended several free/charitable camps, both medical & surgical over a period of 20 years in ophthalmology. 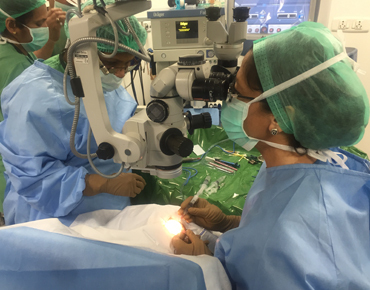 Volume eye surgeries done as charitable projects especially through Lions Sight First Programme,Delhi and Agnihotri Eye Hospital,Hisar. Lamaller Corneal transplants, Keratoconus- LV Prasad Eye Institute, Hyderabad . I was referred by a family friend to Dr. Parul Sharma. The pre-lasik checkup, procedure and post surgery was all smooth and very comfortable. I am very glad and satisfied by the results. I was having high hyperopia -plus number spectacles along with cataract and got treated by Dr. Parul Sharma in Max Hospital Panchsheel Park. after the surgery I am on only using reading glasses. Great thanks to Dr. Parul Sharma for this great help.